It took nearly 13 hours of play and 400 hands, but finally a 2012 World Series of Poker champion has been crowned. Walking away with the gold bracelet and a whopping $8,531,853 first-place prize is Greg Merson! After a handful of eliminations yesterday set the stage for Day 9 of the Main Event today, Merson was joined by Jesse Sylvia and Jake Balsiger to battle to a winner. Merson took the chip lead into three-handed play, but it was far from over. The three players battled and battled. Several short stacks doubled up, the chip lead changed hands numerous times, and at times, no one thought the competition was going to end. Then, on the 382nd hand of the final table, Balsiger's tournament came to a close. With the blinds at 1,000,000/2,000,000/300,000, Sylvia raised on the button to four million. Balsiger moved all in from the small blind for 20.3 million, and Merson called. Sylvia got out of the way, which left Balsiger at risk with the to Merson's . After the and the turn, Balsiger needed help on the river to stay alive. When the finished off the board, it also finished off Balsiger's amazing Main Event run. With his elimination, Balsiger failed to become the youngest player ever to win the Main Event, but he earned a massive payday of $3,799,073 to take home with him. Heading into heads-up play, Merson had the chip lead over Sylvia, but both had plenty ammunition to play with. Merson chipped away early, and then all the money went in on the 399th hand. During the same level as Balsiger's elimination, Merson opened the pot with a raise from the button to four million. Sylvia reraised from the big blind to 9.5 million, but then Merson announced that he was all in. Sylvia started the hand with 69.3 million and tanked for a couple of minutes. Eventually, he made the call and put himself at risk holding the . Merson held the . The two crowds rose to their feet and began chanting for their respective player. Then, it was time for the flop. On the flop, the rolled out, and Merson's hand stayed in front. The turn brought the , and the river completed the board with the . Merson's king high held up to give him the victory as his cheering section rushed the stage. Merson was quick to push his fans away as he made his way around the table to congratulate Sylvia on his effort. For his runner-up finish, Sylvia took home $5,295,149. Merson's rail returned to their seats to wait for the champ, but then they chanted "Jesse! Jesse! Jesse!" over and over as a salute to Sylvia. As stated above, Merson earned the most coveted prize in poker with the WSOP Main Event gold bracelet along with over $8.5 million, but he also won another prize with this victory. 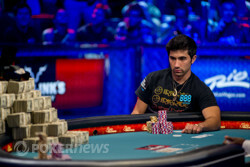 With his win, Merson overcame Phil Hellmuth to win the 2012 WSOP Player of the Year. It's been quite the year for Merson, and he will forever go down in the poker history books for his performance. 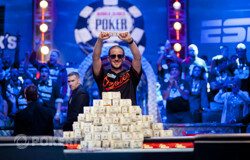 Congratulations to all of the winners, and especially Greg Merson on becoming the 2012 WSOP Main Event champion! And until next time, goodnight from Las Vegas! 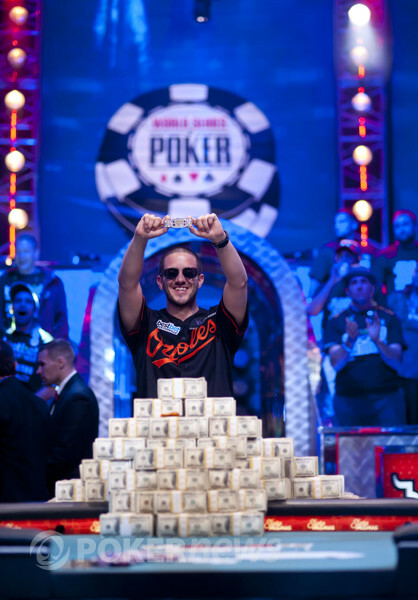 Greg Merson captures the 2012 World Series of Poker Main Event title besting Jesse Sylvia. Greg Merson had the button, and raised to four million. Jesse Sylvia three-bet to 9.5 million, Merson four-bet jammed for effectively 69.3 million, and Sylvia went into the tank. Sylvia sat up in his chair, silently riffling a stack of red T500,000 chips with his left hand. He began swerving back and fourth in his chair while Merson sat motionless. After 30 seconds or so, Sylvia said something to Merson, who didn't budge. Eventually, Syvlia asked the dealer to pull in the bets. When the dealer obliged, Sylvia examined the pot, then looked back at a projector to examine the chip stacks to start the hand. Chants of "P! O! Y!" filled the stands as the dealer rapped the table and fanned . No help to Sylvia. "Deuce!" one fan yelled. "Diamonds!" yelled another. Sylvia's section was silent as the turned. Merson's cheering section exploded. The Penn & Teller Theater fell deathly silent, and Jack Effel called for the river card. Confetti poured from the ceiling as Merson's family and friends rushed the stage. They were stopped by security before they could go too far however, and had to cheer from the stands. Jesse Sylvia, who entered the final table as the chip leader, will take home $5,295,149, and Greg Merson is the 2012 World Series of Poker Main Event champion! Jesse Sylvia had the button. He limped in, and Greg Merson checked his option in the big blind. The flop came down , and both players checked to see the pair the board on the turn. On fourth street, Merson checked first. Sylvia then bet 2.5 million, and Merson folded. Greg Merson had the button, and opened to four million. Jesse Sylvia put in a three-bet to 9.1 million, Merson quickly four-bet to 18.4 million, and Sylvia tanked for 30 seconds or so before folding. Over 12 hours ago, the final three players joined at the Rio for a press conference. Here is what they had to say before starting the grind of a lifetime! Jesse Sylvia had the button. He limped in, and Greg Merson checked to see the flop. Merson check-called a bet of 2.5 million, and the turn brought the . Merson checked, and Sylvia checked back. The landed on the river, and Merson led for 5.5 million. Sylvia folded, and Merson won the pot. Greg Merson had the button, and he gave Jesse Sylvia a walk.